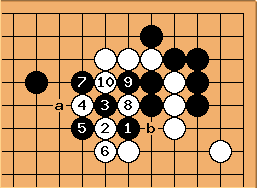 loosely surrounds the two black stones. The stone is in just the right place to prevent Black from pushing out along the right side. 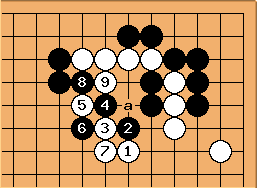 If , White plays and squeezes Black. completes a nice symmetrical shape. If , the standard reply at stops Black cold. 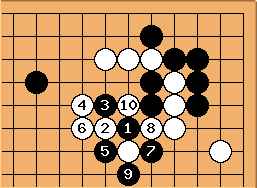 This seems the most interesting, but it looks like the combination of and prevents Black from getting away. 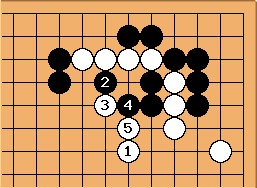 White has to be careful and connect at against . 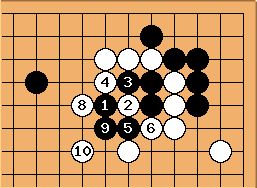 Now Black is again short of liberties after . 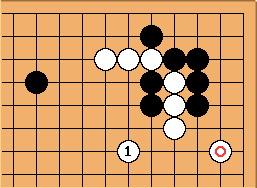 If next Black at a, White plays b. Against and , and squeezes Black in the other direction. The only move here is , which may be a kind of a blind spot. 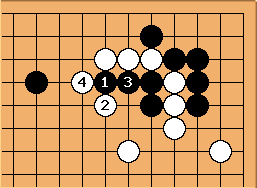 Compared to the original problem, must be played here instead. Playing at a turns it into a ko.